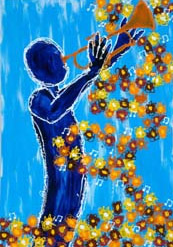 Promote your summer arts event! 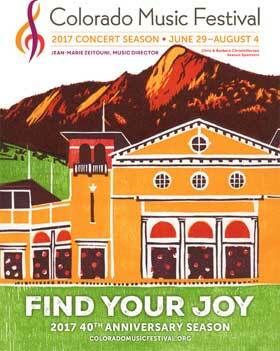 Advertise in the annual Colorado Music Festival Program. Deadline May 27. Learn more here. Life may not get any better than spending a delightfully warm summer evening in the shadow of the Flatirons attending the Colorado Music Festival or the Chautauqua Summer Festival at the historic Chautauqua Auditorium in Boulder, Colorado. The Colorado summer and memorable performances in the enchanting venue translate into large audiences that return year after year. The performances’ wide variety means that the audiences — all receiving the Colorado Music Festival Program — have diverse interests in the performing arts. This wide-ranging arts audience consists of 44 percent of the attendees earning more than $75,000 and the overwhelming majority owning their own homes and frequently dining out. They are young, old, single, families, rich — a fabulously diverse audience. These appealing demographics create a golden advertising opportunity in the Colorado Music Festival Program, published on May 30 with an April 25 advertising deadline. The Colorado Music Festival Program is a summer-long advertising opportunity supported by far-ranging editorial content that covers all of the concerts, films, speakers and dancers throughout the season. The program always has a striking original-art cover, glossy stock and sharp full-color presentation. The stories provide insightful background on the performances and performers, even including fascinating looks at unique instruments used by the musicians. This strong editorial content increases the already summer-long shelf life of The Chautauqua Summer Festival Program because many festival patrons keep their program as a reminder of their memorable trip to Chautauqua. The Colorado Music Festival Program graphically and editorially combines delightful performances and an enchanting atmosphere in a long-lasting keepsake program. For in-depth information on how the Colorado Music Festival Program will benefit your enterprise call 303.443.0600 or 1.800.903.2532.